The gradually increasing attention towards cells as tools for solutions to various diseases makes it indispensable to analyse the behaviour of cells, the implications of different physiological and pathological environments, chemical molecules and other environmental factors on these cells. Equally important is to develop novel imaging and tracking techniques to have an insight into the probable long term outcome when cells are applied in vivo as cells are biological entities whose transformation, bioavailability, actions and interactions after transplantation inside the body cannot be defined or delineated or controlled like the factory-synthesized and reproducible chemical compounds, drugs or devices . In this issue, two important studies have been reported on these lines. The study by Shakoori & Ahmad has investigated the cytotoxic and genotoxic effects of heavy metals like lead and arsenic on human adipose derived mesenchymal stem cells (AMSCs). Stem cells in contrast to post-mitotic or short lived somatic cells possess unique mechanisms to counteract DNA damage as they must persist and function throughout life for proper tissue homeostasis . It has been reported that autophagy in stem cells in response to toxic concentrations of heavy metals helps to mitigate metal-induced toxicity . Arsenic and lead have known genotoxic and mutagenic effects and the increase of their levels in the environment especially in developing countries makes the study by Shakoori & Ahmad important, keeping in mind the serious health consequences associated with these metals, especially the development of cancer. 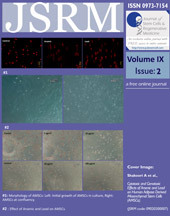 The study by Moossavi & Ansari throws an entirely different perspective to cell research wherein the article provides an opinion that intravital imaging of the intestinal stem cell compartment could serve as a potential target for early detection of colorectal cancer as the stem cell compartment in the intestine acquire the earliest detectable phenotypic change during intestinal tumorogenesis. Therefore in addition to routine in vitro and in vivo analysis of cells and stem cells, studying their genotype and phenotype which are the focus of most of the studies being reported recently, analysis of cell behaviour from an holistic approach and development of novel non-invasive imaging and visualization techniques with high resolution could shed more light on the complex biological phenomena surrounding these cells and stem cells thereby contributing to the progress of medicine. Preethy S, John S, Saravana Ganesh J, Srinivasan T, Terunuma H, Iwasaki M, Abraham S. Age old wisdom of Cell-based therapies with added knowledge in the stem cell era - Our perspectives. Stem Cells and Cloning: Advances and Applications. 2013; 2013(6): 13 – 18. Mandal PK, Blanpain C, Rossi DJ. DNA damage response in adult stem cells: pathways and consequences. Nat Rev Mol Cell Biol. 2011;12(3):198-202. Di Gioacchino M, Petrarca C, Perrone A, Martino S, Esposito DL, Lotti LV, Mariani-Costantini R. Autophagy in hematopoietic stem/progenitor cells exposed to heavy metals: Biological implications and toxicological relevance. Autophagy. 2008;4(4):537-9.